← Dog Files: When I grow up I want to be a DOG! The test of a story is this: Can it be read over and over and still bring insight and entertainment to its audience? If so, then it is good literature, no matter what the age or genre. For parents, this means your child asks you to read it to you so many times that you about have it memorized! For teachers, this means the kids love the picture book you used in your mini-lesson in September, and you see potential to re-read parts of the book to support other subjects throughout the year. This can save time while providing meaningful connections and common prior knowledge to build upon. With this in mind, I’d recommend this next book hot off the presses in 2012 for your personal or classroom collection. Please refer to my “teachable moment” ideas below and adapt them to the classroom or home. 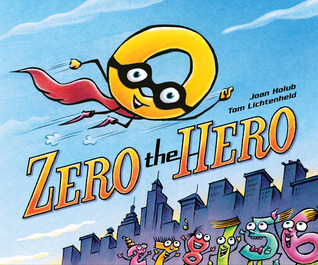 This entertaining book revolves around a comic book kind of hero with high-action illustrations and captions to accompany (and even add further humor) to the text of the story. It is a great underdog story that shows the value of the individual (and teaches some GREAT math ideas). The solution to this tale involves an unpredictable group of characters that march in with their own layer of humor and teachable moments. Setting: Does this story have a setting (place, time)? What would happen if these numbers lived in a big city? Or out in the country? Plot: What was the problem? Solution? Can you think of a different way to solve the problem and end the story? Character feelings: How did Zero feel when _______ happened? What clues (words, actions, body language) made you think he felt that way? I’ve done a great demonstration with an apple when discussing this topic of name-calling. Take a red apple and tell students this apple has skin on the outside, just like us. Review what name-calling is and how it feels. Have kids look at apple. It should look pretty much the same as it did before the drops (in other words, don’t throw it to the ground with all your might). Then cut it open and show the kids the brown and tell them that’s bruising. You couldn’t see it from the outside, and sometimes we can’t see with our eyes how people really feel on the inside. Place value: Zero’s spot in a number makes a big difference. What would happen without him? Brainstorm places that would crumble into disorder: banks, maps, street signs, grocery stores, books, etc… In this story, sums need Zero because of place value: 5 + 2 + 3 = 1?? Also can’t round numbers without zero. Odd and Even Numbers: How does the digit zero affect these types of numbers? List a bunch of odd numbers. Then take out the zero. What do they turn into? List a bunch of even numbers. Then take out the zero. What do they turn into? “Odd numbers felt so ODD without zero.” Even numbers miss him too. Commutative property: When two numbers are added, the sum is the same regardless of the order of the addends. For example 4 + 2 = 2 + 4 Zero tries to go first, but it doesn’t change anything. Identity: Same as Additive identity. 0+(-N) = -N , where N is positive. Properties of Division: http://www.mathatube.com/division-properties.html Website has videos, too! Zero property of division: The zero property of division have two rules. Rule1– If you divide zero by any number the answer will be zero. You have nothing to divide. Rule2– If any number is divided by zero, then the problem cannot be solved. You cannot divide by nothing.